Create aesthetically pleasing fractal designs. Is there a better alternative to Easy Fractal? Is Easy Fractal really the best app in Illustration category? Will Easy Fractal work good on macOS 10.13.4? 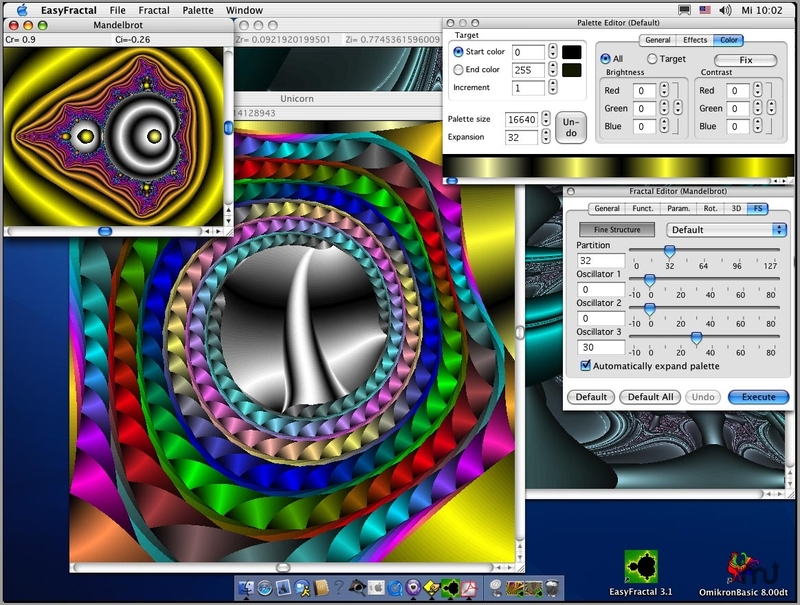 Easy Fractal is an interactive picture generating program so easy to use that almost anybody can conjure richly colored and aesthetically pleasing motifs and structures onto their computer screen. The program works with different iteration formulas, which calculate the so-called Mandelbrot and Julia Sets. A special color palette editor can further enhance these already very elaborately colored pictures, which will result in many different and interesting effects. An endless number of fascinating structures are created by generating pictures directly with the integrated formulas or by experimenting with the enclosed sample pictures. Easy Fractal needs a rating. Be the first to rate this app and get the discussion started!